As portrayed by famous marine explorer Jacques Cousteau "Galapagos is the last wildlife sanctuary". Animals do not fear humans making it a natural paradise and haven for naturalists escaping a busy and noisy outside world. Board one of our yachts for the nature travel experience of a lifetime, the waters are calm and the weather is pleasant (we are at the Equator), the Galapagos Islands travel experience is at the top of the list of every experienced traveler. Interpretation Center: This was built with the cooperation of the Spanish Cience Centre. 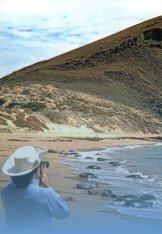 It gives a very good introduction to the Galapagos islands, its marine and land life, fauna and flora. It is located in the outskirts of the small city of Pto. Baquerizo Moreno, which is the capital of the Galapagos Province. Cerro Tijeretas (Frigate Bird Hill): The trip to the Hill takes approximately 20-40 minutes. Once there, visitors are treated to a spectacular view of the white beaches on one side and the roofs of Puerto Baquerizo on the other. The hill is often visited by Frigatebirds, giving it its name. Here it is possible to see Magnificent Frigatebirds and Great Frigatebirds in the same colony. This is the perfect place to compare and learn to distinguish them. This site offers some safe snorkeling without strong currents. It is great for beginners. You can find sting rays, barber fish and butterfly fish. Isla Lobos (Sea Lion Islet): this small islet, located only an hour by boat from Pto. Baquerizo Moreno is separated from the main Island by a narrow strecht of calm water. Upon its rocky shores blue-footed boobies nest and sea lions rest. The atmosphere is one of tranquility and primitive beauty. This shows a very typical Galapagos environment. Punta Suarez: This rocky point of land sustains one of the most impressive and varied colonies of sea birds in the Galápagos. Along its southern shore, high cliffs rise up from the sea affording the visitor spectacular views of soaring birds and of the blow whole, where water spouts up to 50-75 feet into the air according to the intensity of the surf. Post office bay: Historically, this site is the location of a wooden barrel that was placed in the 18th century by the crew of a whaling ship. It has been used since this time by mariners and tourists as a post office. The idea is to carry letters or postcards to their destination by hand. Apart from being the Post Office Barrel, this site was the landing area for some of the first colonists. Punta Cormorant: This site probably, offers one of the largest and the best flamingo lagoon in the Galapagos. It is situated between two tuff cones that give the area a special athmosphere. There are various species of shorebirds to be seen besides flamingoes, the mnost frecuent are common stilts, white-chceked pintail ducks and other migratories. This is a unique zone due to the high percentage of endemism in the plant life. Is also very interesting the two distinct beaches: the “grean beach (due to high percentage of olivine crystals in the sand) and the “Flour sand beach” made up of coral. Charles Darwin Interpretation Center: Although the great majority of Galapagos visitors come here to observe and appreciate natural wonders, it is also interesting to learn how the protection and conservation of the islands are carried out. One of the principal attractions are National Park information center, Van Staelen Exhibition Hall, Breeding and Rearing Center for young tortoises, Lonesome George (tortoise from Pinta), adult Galapagos tortoises in captivity. The Bachas Beaches: These two small beaches are found to the West of Turtle Cove. Their sand is made of decomposed coral, which makes it white and soft, making it a favourite nesting site for sea turtles. Behind one of the beaches there is a small brackish water lagoon, where occasionally is possible to observe flamingos and other coastal birds, such as black-necked stilts and whimbrels. The other beach is longer, but it has two old barges that were abandoned during the Second World War, when the USA used Baltra Island as a strategically point to protect the Panama Channel. (The metal is rusty and sharp, so it is not a good place for swimming). Highlands of Santa Cruz Island: The trail to the highlands leaves from Bellavista and passes through the agricultural zone, near the National Park boundary, the Miconia Zone and then goes to the Fern and Sedge zone. With clear weather (unpredictable) this area affords beautiful scenes of rolling hills and extinct volcanic cones covered with grass and lush greenery all year round. Tortuga Bay: The path is good for birdwatching, it is easy to spot several species of finches as you walk along the path. The sunsets here are excellent. The west cove offers a nice snorkelling and swimming area and a nice spot for relaxing. The white sand beach is considered by many the nicest of the archipelago. It name comes from the sea turtles that go there to lay their eggs. Other species can be found, including pelicans, flamingos and marine iguanas. A small barren island, located in Sullivan Bay off James Island, Bartholomew has two visitors’ sites. At one of them it is possible to climb to the summit of the island, from where visitors can observe a variety of volcanic formations, spatter and tuff cones, lava flows and lava tubes. The moon like landscape provides the most scenic panorama in the archipelago. At the other site, the visitor may swim and snorkel from a beautiful beach or walk across the isthmus to another beach that faces south, where swimming is prohibited. Multi –coloured fish and occasionally penguins may be seen at the base of the tall pinnacle rock, which dominates Bartholomew’s landscape. One of the central islands, Daphne lays north of Santa Cruz and west of Baltra. There are actually two islands Daphne Major and Daphne Minor. Daphne Major is the younger of the two and the one that is visited. Though its location is easily in reach for most cruises, it is a select few that are able to visit this special place. The national park service restricts visitors allowed to visit Daphne. It is only by special permit that boats are allowed to sail close enough to view the wildlife on Daphne. Located between North Seymour and Baltra is the small island of Mosquera. The island consists of a long narrow stretch of white sand, rocks, and tide pools. Created by geological uplift the island has a flat look to it rather than the conical shape of the volcanically formed islands. Mosquera is a regular first or last day visit for boats operating out of Baltra. Mosquera calm waters offer excellent snorkeling opportunities and a stroll down the beach offers views of the brown pelicans, boobies and colonies of sea lions that can be found here. Along the rocks and in the tide pool area sally lightfoot crabs (red lava crabs) scamper back and forth, skipping across small pools of water in search of food. They follow the tide eating the algae and detritus left behind. These crabs bright red on top and blue on the bottom are stunning against the black lava. Sombrero Chino is a tiny island just off the southeast tip of Santiago. Its name (Chinese Hat) describes the island's shape. Those visitors who travel to the island will find its special landscape worth the visit. Though centrally located it is one of the least visited sites in the area. National Park Service restrictions have limited the number of visitors to Sombrero Chino. Multi-day cruises with 12 passengers or less are the only ones permitted at this site. The landing is on a beautiful crescent-shaped white sand beach, home to sea lions and sally lightfoot crabs. The trail on Sombrero Chino's explores its volcanic origin, one of the most evident in the islands. The lava rock is very fragile and tends to break off when people walk over it. The sharp outcroppings caused from these breaks make it necessary to bring good shoes. Patches of pahoehoe lava, cracked lava and lava tubes can be found on the island. While the path does not lead up the striking red rust sides of the Sombrero to the caldera, it does venture high enough on the island to offer some spectacular views of the waves crashing below. Snorkeling in the waters near Sombrero Chino can create a stir; white-tipped sharks frequent the area, as do the playful Galapagos Penguins and sea lions. These are two small islets that were uplifted a short distance from the East Coast of Santa Cruz. The unusual vegetation and location of the island create an interesting landscape in which the fauna and flora of Galápagos are enhanced. Moreover despite its small size, some of the most interesting and outstanding species of the archipelago occur here. It is possible to guarantee the observation of land iguanas that often are in the shade of a cactus. Nesting on the rugged southern cliffs, are usually swallow –tailed gulls, which seen along with various other sea birds. The protected rocky seashore is a prime habitat for a large colony of noisy sea lions. The principal attraction of Plazas is the land iguanas, the sea lions and the swallow – tailed gulls. Also we can see yellow – tailed mullets, Audubon’s shearwaters, red-billed tropicbirds, frigate birds, and brown pelicans gliding past the cliff. Puerto Egas: Wet Landing. James Bay at the western end. Puerto Egas with its black sand beaches was the site of small salt mining industry in the 1960s. A hike inland to the salt crater is an excellent opportunity to sight land birds such as finches, doves, and hawks. A walk down the rugged shoreline, especially at low tide, will turn up many marine species. Iguanas bask on the rocks and sea lions laze in the tide pools. At the end of the trail there is a series of grottoes or sea caves where fur seals and night herons are found resting on shady ledges. The wet landing on the dark sands of Puerto Egas, James Bay leads to one of the more rewarding visits in the Galapagos. First, a trail leads inland to the remains of a salt mining operation, one of several largely unsuccessful attempts to commercialize the Galapagos. Some groups will make the 1 hour round trip to the Sugarloaf Volcano (about 1000 ft elevation). But it is the Fur Seal Grotto that produces the most pleasure for visitors. 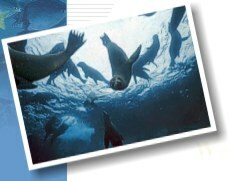 Here one can get very close views of both fur seals and sea lions in a series of rocky pools. For many, this is the only opportunity to see the Galapagos fur seal, once thought to be on the verge of extinction. In addition to the fur seals. James Bay offers the best opportunity for tide-pooling in the Galapagos. Sullivan Bay: This visitor site provides a unique opportunity to view a recent lava flow of approximately 100 years old. The East Side of James Island is known to have barren volcanic landscapes, dominated by black pahoehoe (ropy) lava flows of very young age. On the surface of the lava is possible to observe some tree that was carried down by the flow of the fresh lava. It is also interesting to see how some Mollugo plants are starting to colonize the small lava fissures. 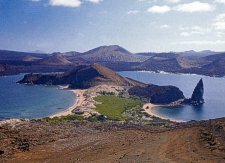 Chinese hat is a tiny Island just off the southeastern tip of Santiago Island is less than a quarter of 1 sq km in size. It is a fairly recent volcanic cone, which accounts for its descriptive name, it has the shape of a down-facing Chinese hat. The hat shape is best appreciated from the northside. Opposite Sombrero Chino, on the rocky shoreline of nearby Santiago, Galapagos penguins are often seen. A 400 m..trail goes around the cove and through a sea lion colony - marine iguanas cover the landscape. The volcanic scenery is attractive, and there are good views of the cone. There are snorkeling and swimming opportunities in the cove. Isabela is the largest island in the archipielago. This island consists on a chain of five volcanoes, from which Volcano Wolf is the highest. Puerto Villamil: is a small port on Isabela, where not many travellers pass by. The Experimental Station is located very near Puerto Villamil in the south of Albemarle. Here the Galapagos National Park experiments with the reproduction process of the subspecies of geochelone elephantopus gunteri (tortoise). Volcano Sierra Negra, located at the southern end of Isabela, is one of the best and most impressive examples of a volcano in the archipelago. This is the second largest crater in the world after Ngorongoro in Africa. Urbina Bay: located on the western coast of Albemarle Island at the foot of Alcedo Volcano, was uplifted from the sea in 1954. Flightless cormorants and pelicans nest along the coast during their nesting seasons, and tutles and rays can be seen in the bay. Highlands include large and colorful land iguanas. Tagus Cove: a tour along the cliffs in a launch will give the visitors a good chance to see the Galapagos penguin, the flightless cormorant and other sea birds. Elizabeth Bay: is a marine visitor site, the excursion is done by zodiac, there is no landing point. Your zodiac ride starts with a visit to the Marielas islets where there is the largest and most important penguin colony in the Galapagos Islands and their breeding site. The excursion continues into the cove which is surrounded by red mangroves you can admire the red root and green leefs, to be seen here are sea turtles, flightless cormorants, spotted eagle rays, golden rays, brown pelicans and sea lions. Often to be seen are Galapagos Hawks soaring overhead and schools of Pompanos and Dorados below. 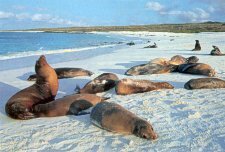 Fernandina is the third largest, the youngest and westermost island in the Galapagos. Many eruptions have been recorded since 1813, making this island most likely to have volcanic eruption and witnessing them. Puerto Espinosa: across Tagus Cove, is a visitors site where some of the unique species of Galapagos can be seen. Marine iguanas conglomerate in large groups than in any other island. They bask around in the sand, swimm near the shore and blocking the way at the landing dock. Among these different species, is the Flightless Comorant. A bird that do to the lack of predators had to adjust their way of survival and perfectionate their skills of finding food in the ocean. Their wings, tails and feet progressively adapted for swimming. To see these birds, is to witness evolution happening right infront of you. Santa Fe is one of the most popular destinations for shore excursions. It has a two trail choice for visitors, one of which takes you to the tallest Opuntia cactus in the Galapagos. While the other trail takes you into the highlands where the land iguana may be seen. After a long walk, a swim in calm waters or snorkeling with playful sealions, sound pretty tempting. Located slightly to the north of Baltra, North Seymour is a low, flat island, formed as a result of a submarine lava formation uplift. It is covered with low, bushy vegetation, which contains the largest colony of magnificent frigatebirds in the Galapagos. There is also a large population of blue-footed boobies that perform an amusing courtship dance, when nesting conditions are right. This goofy stride, picking-up high their blue feet in a slow motion, wing spreding, whistling and honking; is one of the highlight of this island.